2013 has already seen many reports of mobility scooter theft. Thefts have been occurring in many places in the country, in areas such as Middlesbrough, Coventry and Weymouth. 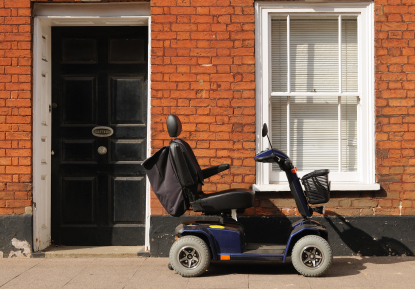 For those victims of mobility scooter theft, it can put their life on hold as they no longer have the ability to leave their homes and for many this is their only means of transport. Mobility scooters are being stolen from communal areas in blocks of flats and back gardens, highlighting the importance of mobility scooter security. It is unfortunate for these victims of theft that the mobility scooters are usually stolen by young vandals who just want a joy ride, while they are left house bound. Mrs Cole from Weymouth who’s mobility scooter was stolen from her flat said “The scooter was my only form of transport and now I’m housebound. I can’t even take my dog out for a walk…. I don’t know what I’m going to do without it” The loss of a mobility scooter can have a devastating effect on someone’s life. If you are concerned about the security of your mobility scooter and want to keep it safe, take a look at the Asgard Mobility Scooter Garage, designed to house your mobility scooter and keep it safe. Find out more about the mobility scooter garage from Asgard, on the Asgard website.